CRAZY DISCOUNT! Was: $499.95 Now: $229.97! 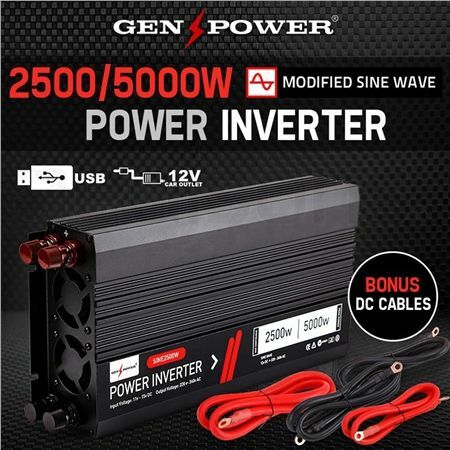 With the GENPOWER 2500W power inverter, you can stay connected anywhere in the world. Simply hook it up to your car, 4WD, caravan or boat battery, and you've got power to run your 240V appliances just like at home. And, speaking of home, with your GENPOWER inverter, you can keep running lights and refrigeration when there's a power outage. 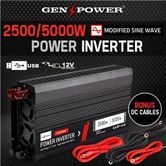 The GENPOWER 2500W power converter literally offers a battery of benefits. Compatible with any 12V battery, it gives you standard AC power just about anywhere. And with automated shutdown functions, your GENPOWER makes for perfectly safe driving, protecting you from overloading, overheating and short-circuiting. Simply connect the GENPOWER to your car, 4WD, caravan or boat battery, and you can feel right at home wherever you are, with the power to run household appliances always within your reach. *Please note: Although most appliances run well on modified sine wave, some can be damaged by it. Modified sine-wave inverters are economic solutions, but if uncertain as to whether it'll damage your equipment, please check with the manufacturer of whatever you want to plug in. Note Although most appliances run well on modified sine wave, some can be damaged by it. Modified sine-wave inverters are economic solutions, but if uncertain as to whether it'll damage your equipment, please check with the manufacturer of whatever you want to plug in. Package Dimensions (LxWxH) 45 x 23 x 12.5cm approx. Well the delivery came after the inverter but they were quick. We have installed it as yet but hope to next week. Can tell you more then.